What a day! It isn’t often that we get to enjoy temperatures in the 50’s in January, but 18 sun-and-mountain loving individuals assembled to enjoy just that. 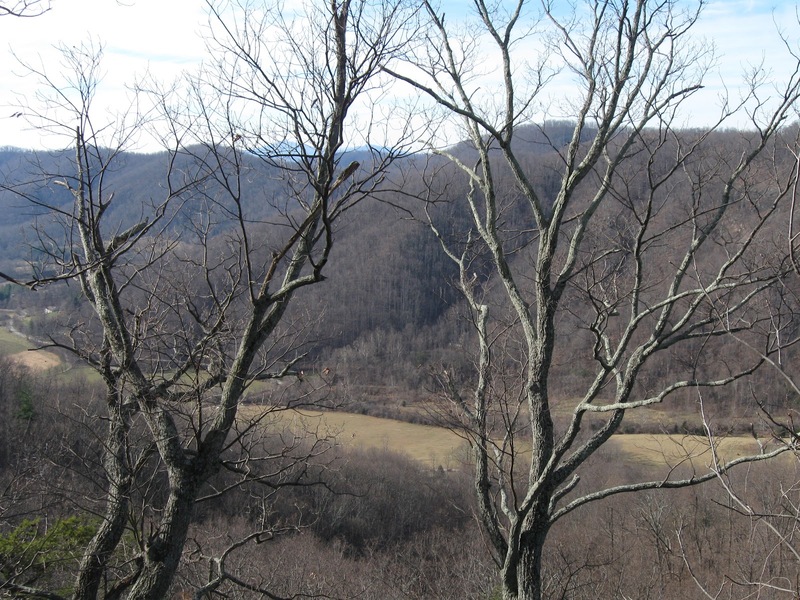 While the Blue Ridge Parkway was closed, Waynesboro Asst. Commonwealth’s attorney David Ledbetter had provided recon for the hike leader to furnish an alternative launch point on the Parkway providing us the chance to stick with the spirit of the scheduled hike. The group meeting at AHS included some special faces: Jeff Monroe and Gracie, and Rich Bard hiking with us for the first time in ages, and likely mainly for the beer at the end; David Dalloy, the first time with our group; Pat Skelly, here from Georgia on his long weekend celebration hike; and Mary Craig, returning to hiking as a New Year’s resolution. Our veteran hikers included: Ken Moss, upon his return from a business trip in Africa; John Shannon, pack loaded waiting for the call for trail maintenance; Marian Styles, joining the hike after the weather had cancelled her trip to Kentucky; Briana Taylor, cheerfully looking for a winter hike; CJ Woodburn, who forgot her coat, but was able to sweet talk Dan Ralston into loaning one of his collection for a few hours; Dave Borszich, also looking forward to post hike brews; and Karen Ramsey, who was willing to hike even without knowing where we were headed! 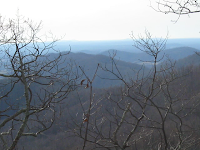 We caravanned to the top of Afton Mountain where Barbara Martin, Pam Farrell, and Jill Patterson joined David Ledbetter to lead us to the new starting point which was on the Blue Ridge parkway about a mile from the visitor’s center. We hiked the Parkway to the trail head in the Humpback Rocks parking lot. While there was a little snow on the Parkway, we hiked as a wide spread out group, enjoying the bright blue sky on our flat path. Our loop followed the Old Howardsville Turnpike for a short while before we headed north on the AT. There was no ice on the trail; it was either snowy or muddy, but the traction was quite good. Our lunch spot was the Glass Hollow Overlook, which we all trapsed past, with the hike leader distracted by good conversation. David Ledbetter again saved the day by being the only one who had seen the obscured overlook sign, and he led us back to spur trail which allowed us to pick up another ½ mile of hiking on the way to our sunny lunch spot. 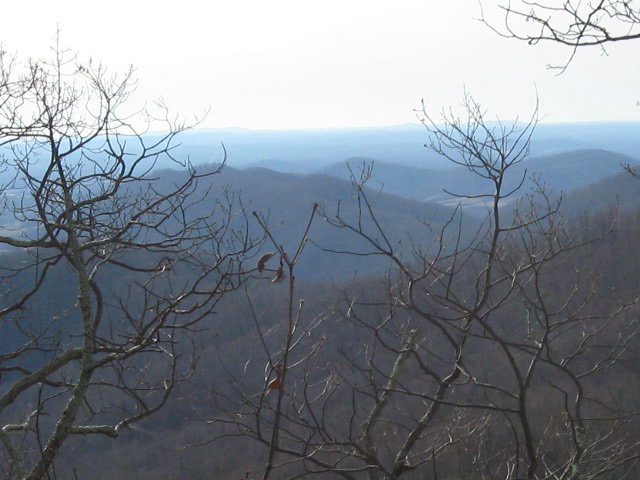 The view was stunning as we looked down in Glass Hollow and toward Charlottesville and all sites to the east. We enjoyed our lunches, chatted on the warm rocky outcropping, and indulged in brownies which would help us continue our journey. Dan led us on the Albright Trail as we looped up Dobie Mountain in search of the downed plane remains. While Jeff Monroe has seen the remnants without snow on it, it was Dave Borszich who spied it this time, after everyone else had walked past the spot. I was certainly grateful for my observant David hikers! While some climbed the hill to inspect the remains of the 1963 wreckage, others stayed on the trail preparing for our return along the snowy trail. The ascent up Dobie Mountain was the only real climb for the day, and it was lovely with a few inches of snow which provided excellent footing. We were able to keep sight on the awesome Humpback Rocks during several parts of the day as it towered above us. 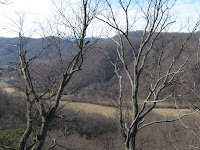 After returning to the Humpback Rocks parking lot, we retraced our route along the Parkway back to the cars. As it was now early afternoon, there were others walking the Parkway too. Our 6+ mile route was perfect for this winter day and we returned to the cars in enough time to allow those who were inclined to have a brew and bite at Blue Mountain brewery. The place was packed in the nice weather, with bus loads of college students. Being the rugged hikers we are, we sat at the picnic tables in the sun, wearing our warm jackets. Certainly not a typical option in January, we all made the most of the extraordinary weather and sitting outside looking at our beloved mountains. 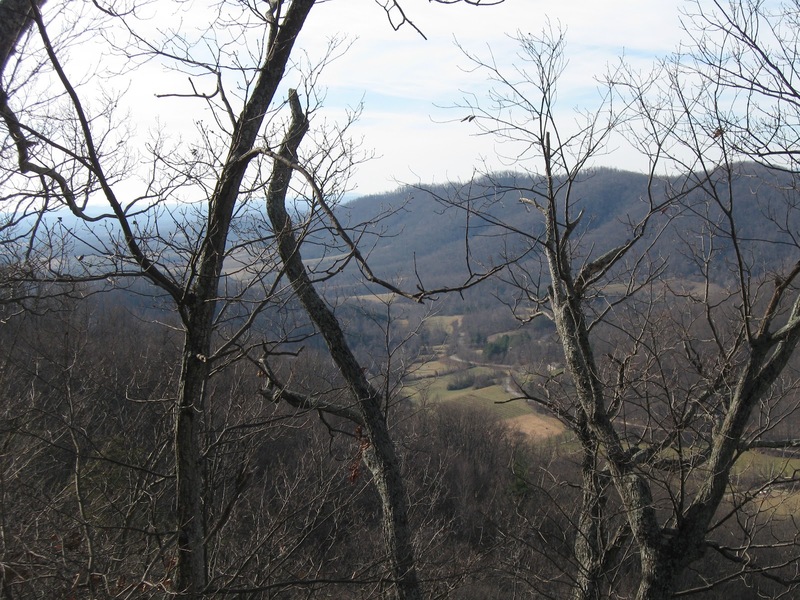 The first hike of the year was located at a beautiful parcel of land in Nelson County owned by the Nature Conservancy. It was led by infrequent hike leader, Andy Willgruber. John Shannon, C.J Woodburn, Dan Ralston, Marian Styles, Lindsay Brown, Pete and Bev Fink, John Brandt, Briana Taylor, Iva Gillet, Leon Gorman and Karen Ramsey all showed up. They were joined by newcomers from Richmond, Mary Lindert and Neil Bangs. Four vehicles departed AHS for the pleasant 35 minute ride on Route 29 South. Three vehicles arrived in good time. We all waited and hoped that Leon and Karen were not then approaching the outskirts of Lynchburg. Indeed, our wayward car did eventually make it for the start of the hike. It's always interesting as a newer hike leader to have the company of veteran hike leaders on the hike. You must combine the skills of a diplomat with those of an infantry commander. Both of these would be necessary today. Andy sent the always intrepid Iva out to lead and she set a perfect pace. The first mile-and-a-half rose steeply, so a long stop at the first sunny out- crop we found was appreciated. It included a nice view and review of the elevation we had just gained. It was actually not easy to leave this pleasant spot. We continued the hike following the up-and-down crest of Woods Mountain. A second rise with a nice south-facing rock outcrop was noted, but passed up for lunch. Iva headed for the highest knob on the ridgeline with the best overall view for that. The exact lunch spot was up-for-grabs when the hike leader finally arrived on top. People were milling around aimlessly. So, he quickly decided on a sunny spot with a grand view of the "Religious Range" of the Blue Ridge (and our backs to the communication towers). We commenced eating only after Andy had to almost forcibly remove Iva from a weedy patch she had chosen. Our sun-drenched lunch was a joy. The hike leader was criticized for not providing sweet treats. Andy was merely trying to respect everyone's newly minted New Year's resolutions of losing weight and less sugar intake. He also knows that John Shannon will never disappoint! It was time for the cultural/historical portion of the hike. The hike leader led the group down to a view of the beautiful (but not so fortunate) cove just to our north drained by Davis Creek. The tragic story of Hurricane Camille and Nelson County was described. On the night of August 19-20, 1969, the remnants of Camille slammed into a cold front over the Blue Ridge and dropped 37" of rain in a five hour period. 153 people lost their lives in Nelson County that night. 52 of them were lost in the valley we were now overlooking. Only three of 35 homes were left standing. There was an observer located at the Rockfish/James River confluence the next day. He saw the mighty James River actually flowing backwards upstream of where the Rockfish entered with its 3/4 of a year's worth of rainfall in one night! We started encountering more minor blowdowns on the downhill trek. We were limited to having only John Shannon's corona saw. But we did enough clearing for the Conservancy to earn our hike this day. Today's hike was not particularly long (5.5 miles), but it was fairly rugged, with significant elevation changes. This hike leader felt Lindsay's judgement of "brutal" was a little exaggerated, but newcomer Neil might agree. He started to struggle with cramps during the last mile of the hike. With frequent rests and Neil's gritty determination, the end of the trail was reached! Our first post hike destination was Rapunzel's. Unfortunately, we arrived 45 minutes before they opened. In the delay in coming up with an alternative, Mary and Neil understandably decided to head back to Richmond. We hope they return to hike with us as they continue to train for a trip later this year. We did lose Dan and C.J. with them. Plan B was the Lovingston Cafe. Appetizers, dinners, desserts, coffee, cider, beer and soft drinks were ordered and happily consumed. Given we were the only customers at the time, our attentive waitress was happy to put up with our individual checks. We enjoyed a pleasantly quick ride home to AHS and arrived at dusk. All in all, it was a day of good fortune in Fortune's Cove! This hike leader hopes all the year's hikes are as similarly blessed! The weather started out foggy, as predicted. As we were driving to the trailhead, the sun started to shine and it turned out to be a gorgeous day. Sixty degree weather is the perfect kind for hiking. A good group of 13 people showed up. Neil and Mary from Richmond, Virginia returned from last week's hike to join us. It was good to see them again. John Brandt's son, Thomas, also joined us. It was nice to see him on the hike as well. Dave Borszich, Pete and Bev Fink, Eileen Seamans, CJ Woodson, Irene Burke, Marian Styles, Iva Gillet and John Brandt were also a part of the group. The first part of the hike was a little challenging with a fairly steep hill climb. The view of Old Rag from this part of the trail was worth the climb, however. Everyone made it to the top safe and sound. We decided to have lunch at the trail junction before descending down Broad Hollow. John Brandt brought out the cookies for a little carb boost! The descent along Broad Hollow Trail offered some nice views. People took advantage of the picture taking opportunities. Rock walls, a shelter, and streams were all part of the scenery as we hiked down. We made it back to the parking lot and decided to head to Etlan Store for some barbeque, drinks and ice cream. Just what we needed to finish out a great day!